She grew up sneaking into screenings of Indian melodrama and Chinese Kung Fu films in her neighborhood cinema. African, Commonwealth and American literature captivate her. Award-winning filmmaker Florence Ayisi's window to the world in her Cameroonian hometown, Yaound', was not the familiar television set. An innocuous radio at high school was her most steady channel of information. Each time she listened to news on the radio, Ayisi would visualize what she heard. The ability to 'think in pictures', she imagines, was thus born. It has been an arduous journey since those school days to the Cannes Film Festival where, in 2005, 'Sisters in Law' - a film she co-directed with acclaimed British filmmaker Kim Longinotto - bagged the Prix Art et Essai. And the journey, she says, has only just begun: "'Sisters in Law' is the start of a wider project to document other and different stories from Africa." With her easy, swaying gestures, and warm and friendly demeanor, Ayisi, 40, is at once accessible and endearing. But as is true of many politically conscious Black filmmakers, (like Owen Ali Shahdah, Med Hondo and Amma Asante) she has a determined urge to challenge stereotypes about her continent. The hackneyed portrayal of Africa in Western media as poor, hungry, and disease- and strife-torn has always irked and angered Ayisi. While those facts, she agrees, cannot be denied or evaded, there is another reality to Africa that would definitely shatter the "Africa as a charity case only" image. 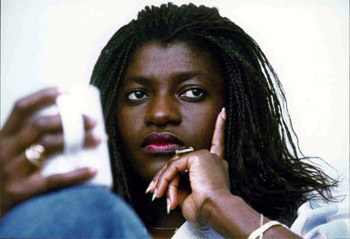 After obtaining a degree in English from the University of Yaound', Ayisi arrived in the UK in 1986 on a scholarship from the Cameroonian government to study film production. One of her earliest films - 'Where the Cows Go' - bagged the special jury prize at the Chicago International Film Festival, 1992. While working as a freelancer in films and other media, Ayisi pursued a Master's degree in theatre and media direction and production. It was during this time that she was sensitized to, and formulated her concerns around, representation of Africa and its Black people. In the Western environment, where she now was, the image of Africa was too basic, much rougher than the ground realities and images pervading societies in Africa itself. 'Sisters in Law', which has now travelled widely and picked commendations nearly everywhere it has been screened, glimpses the complex Cameroonian society, where women's education and grassroots initiatives have contributed to bettering their social and economic status. The film maps two women judges resolving domestic conflicts. Through a series of cases, we encounter the intricate intermeshing of gender with development, education and social organization, and are exposed to very hard-hitting judgements (by the two women judges) - all smattered with moments of irony and humor. Perhaps it is Ayisi's fascination with the "action-packed, magical and emotional" Indian and Chinese films that has seeped into her filmmaking - because her films are marked by strong drama, human emotion and social contradictions. The subject of the woman is one of Ayisi's central concerns. Her work is also deeply concerned with and seeks to explore issues of marginalization in varying contexts. While in Cameroon, being an Anglophone (an English speaking person, especially in a culture where other languages dominate) relegated Ayisi to an alien-like status. In Britain, the wider identification of being a Black woman accounts for her difference and the limitations she was faced with. But Ayisi cherishes her position as unique: "I am a Black woman. I understand what that means and how that is perceived. But cultures and societies evolve constantly. Stereotypes bypass this, simplifying and distancing people. I understand the conditions the women of Africa are faced with; at the same time, I appreciate and celebrate womanhood, which transcends barriers of race and nation." When Ayisi speaks of her new project, 'Our World in Zanzibar', there is a happy gleam in her eyes. "It has been a very emotional and close encounter," she says. This film maps an artistic project that is a conversation between local women artists and women from the First World, who have migrated to live in Zanzibar. The migrant women - from countries such as the UK, the US, and Holland - share their life stories with the Zanzibari women artists, who then articulate and express these stories through their medium and language. "When an African woman retells an American's life story through her dance and costume or poetry, the American is drawn to tears. I think such creativity is very visionary. One can reach beyond one's immediate identity and touch a fellow human being. This is extraordinary and cannot go unnoticed," says Ayisi, explaining her inspiration for the project. And this, perhaps, is the key to the power of Ayisi's films - she works straight from the heart, seeking conversations between different cultures. 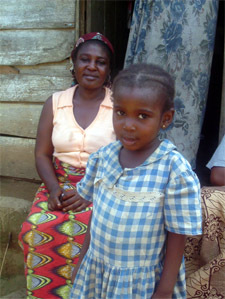 Ayisi was away in the UK when her mother died, thus missing the chance to bid her goodbye. It took her two years to reconcile with the absence of her mother in the markets they had frequented when she was younger. In her six-minute film, 'My Mother, Isange', Ayisi converses with us, the audience, recollecting the matter-of-fact, yet profound, practical teachings her mother shared with her during her lifetime. While uneducated herself, it was Isange's dream that her daughter gain an education and work in a "big office like in the city". And although Ayisi could not attend her mother's funeral, her work and the life she has carved for herself make for a tribute in honor of her mother. Ayisi has opted to live in the UK, where she divides her time between filmmaking and teaching at the International Film School, Wales. While the former comes rather instinctively, Ayisi is drawn to the latter for she holds the combination of film and education as particularly crucial. "It is very rewarding to see a young person evolve into a full-fledged filmmaker who can apply ideas practically. Film education is an important discipline in contemporary society, because it provides a critical framework for young people to learn."